The Feminine Mystique (1963) is a powerful critique of women's roles in contemporary American society. Drawing on new scholarship in the social sciences, Betty Friedan attacked a wide range of institutions--among them women's magazines, women's colleges, and advertisers--for promoting a one-dimensional image of women as happy housewives. This image, Friedan suggested, created a "feminine mystique," a belief that "fulfillment as a woman had only one definition for American women after 1949--the housewife-mother." The book soon became a national best seller, with over a million copies sold. This Norton Critical Edition of Friedan's phenomenal book traces its cultural and historical significance over its first fifty years. 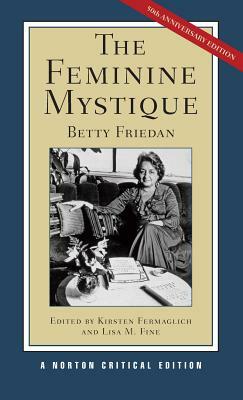 The text of The Feminine Mystique is accompanied by an introduction and is fully annotated. Friedan's book is the product of her early life as an activist, a student, and an intellectual while also drawing on her own experiences as a wife and mother. "Origins and Influences" includes writings that helped shape the author's ideas about women and society. These works are topically organized: "Childhood World," "Intellectual Influences," "Domesticity and 'Momism' during the Cold War," "Popular-Front Feminism," "The Power of the Feminine Mystique on Betty Friedan?," and finally, "Female Labor Force Participation Trends in the Twentieth Century." Among the authors included are Robert S. and Helen Merrell Lynd, Friedrich Engels, Margaret Mead, Amram Scheinfeld, and Simone de Beauvoir. The 1960s was a time of great upheaval in America with sweeping changes throughout society including women's rights, civil rights, peace movements, environmental movements, student activism, and the sexual revolution. It was also a time when a number of American Jewish intellectuals, including Friedan, made comparisons between American life and Nazi destruction. "The Turn of the Sixties: Political, Intellectual, and Cultural Ferment" provides readers with an understanding of The Feminine Mystique's contemporary context through relevant U.S. government documents and through the voices of, among others, Eleanor Roosevelt, Reverend Martin Luther King Jr., Helen Gurley Brown, and Bruno Bettelheim. More impressive than even The Feminine Mystique's best-seller status and the debate it sparked in the national press is its broader cultural significance. Hundreds of women wrote to Friedan about how the book affected them personally. "Impact" includes a selection of these letters from the Betty Friedan Papers, along with feminist writings from the second (Pauli Murray, Robin Morgan, Bella Abzug) and third (Rebecca Walker, Naomi Wolf, Jennifer Baumgardner and Amy Richards) waves of feminism, and the backlash against the movement and The Feminine Mystique (Phyllis Schlafly). The book also includes a section on the scholarship on The Feminine Mystique, with excerpts from scholars such as Daniel Horowitz, Joanne Meyerowitz, Ruth Rosen, and Stephanie Coontz. Analyses of Betty Friedan as a historian, the evolution of her ideas, and the legacy of The Feminine Mystique on its fiftieth anniversary are included. A Chronology of Betty Friedan's life and work and a Selected Bibliography are also included.